Family Volley: Sweet Relish - GUESS Handbag Giveaway!!! Sweet Relish - GUESS Handbag Giveaway!!! Entry takes less than 5 seconds!!! Today I want to introduce you to one of my favorite new sites on the internet - Sweet Relish! Sweet Relish is a fun and useful way to add some flavor to your online shopping experience and share all your great find on the web. 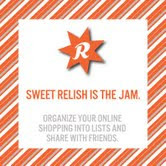 People use Sweet Relish to save their favorite products, organize them into lists, discover sweet new items and connect with friends to share all of the interesting things they come across online. The way it works, is easy. You create list as you browse your favorite online shops. All you do is hit the "Relish" button and the product is added to one of your lists. Think Pinterest, but for buying all your favorite online finds. You can build a birthday list, a list of your favorite shoes, or a list of possible gifts for your husband. I have a dear friend who lives in California. We love sharing clothing finds with one another and ask for the others opinion. We use to have to copy and paste the links to the products in emails. Now, we can simply save them to our lists and then share. It is so much easier and quicker. I can also look through her boards to get ideas for birthday and Christmas gifts for her. All you have to do is add the "Relish" button to your browser. Takes about 2 seconds, and you're ready to go. I have started my list, and can see how this is going to get addicting, really fast. Sweet Relish is different from other social tools, because posts include a link to purchase the product so you can create a shopping list, wish list, share your must-haves and swap feedback with the people you know and trust. If you love Pinterest, you will be hooked on Sweet Relish. You should start your own Sweet Relish list today. Today, Sweet Relish is giving away a Fabulous Guess Baden CarryAll Handbag in White!!! As part of the 12 Days of Handbags. The perfect gift for you, or someone you love this Christmas Season. The Bag is elegant and on-trend. It has golden hardware and buckle accents. You will love it! Gold tone hardware; signature plaque at front; woven handles; belt accents on sides. The bag is valued at $128 and the winner will also receive over $125 worth of other fun items from Sweet Relish. Entry is SOOO easy, it will only take a second. Literally. One Second! Remember, any lists titled #SITSSweetRelish are entered to win a trip to BBC Phoenix in April.